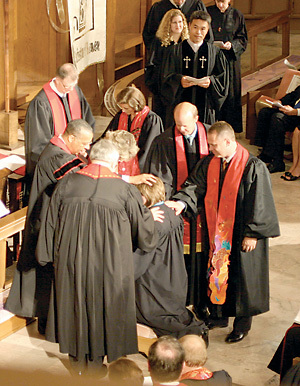 The Conference Board of Ordained Ministry is composed of clergy (elders, deacons, associate members, local pastors) and laity from across the Oklahoma Conference. The Board serves as the final recommending body in the conference as a person applies for licensing or ordination. Nearly sixty people serve on this board, giving much of their time and energy to the process of credentialing people for ministry within the Oklahoma Conference of The United Methodist Church. The General Board of Higher Education and Ministry has a handbook for members of boards of ordained ministry. Each member of the Oklahoma Conference Board of Ordained Ministry may obtain a copy from GBHEM.